After almost three decades of Treaty of Waitangi settlements, of “biculturalism” and “partnership” between Maori and the Crown, Maori remain at the bottom of all social statistics, such as income, employment and life expectancy. Why is this? And what can be done about it? The settlement regime is a neoliberal extinguish-ment of Land & Treaty rights. Its purpose was twofold, to co-opt & contain & pacify a radical treaty protest/land rights movement within the state’s neoliberal agenda. Secondly, with Maori leadership focused on the settlement of historical grievances with the state, the vast majority of non tribal working class urbanized Maori were easy to be forgotten as the rubbish of structural adjustment. Working class Maori still haven’t recovered from the extremist economic “reforms” of the eighties when an entire generation of Maori & Pacific Island children and youth has suffered under the reforms launched by the Labour government of 1984-90. This is exactly what was intended way back when the treaty settlement process & fiscal envelope were touted and subsequently implemented. Maori have already been kicked in the guts from the recession; disproportionally we have already the highest percentage of recently unemployed. Treaty settlements distracted us from our struggle, when our grassroots whanau were going to the wall. The great majority of our flax roots, our workers, our youth, our gang members and all our whanau at the bottom of the heap struggling to survive. The most dispossessed in Aotearoa will have nothing to loose. The liberation of the great mass of our people will not come with more failed parliamentary reformism. If an economic structural adjustment put & kept our people on the bottom of the heap only a peoples’ structural adjustment (a revolution) will improve the negative social indicators & living standards of Maori. The Maori Party’s co-option within the National government is completely opposed to the interests of the majority of Maori who are working class. It seems foolish to try & enact a pro Maori agenda (albeit a conservative one) within an anti worker & anti environment government. The Maori Party's endorsement of Nationals ETS [Emissions Trading Scheme], put the interests of the dairy industry and the tribal capitalists of Iwi Corporations, ahead of duty to care for our environment & the survival of Indigenous peoples in the Pacific . What to do? Working class Maori, our beneficiaries, our gang whanau, our youth need to educate themselves about their struggle & organise in their communities & workplaces. We can’t afford to think that any political party will represent our interests. Self Determination can come from below, Tino Rangatiratanga will only be meaningful & lasting if it comes from below. 2) A huge amount of land stolen from Maori is now in private hands, but Treaty settlements only involve Crown land. Should privately owned land be part of Treaty settlements? The sacred cow, middle-class property rights. Ripe for the picking. Occupations should increase & intensify, not only against privately owned land, but land & resources taken by transnational corporations. Browsing your blog I first felt anger, then sadness. I am sorry that you feel the way you do, but nothing I can write can cure you of your racism. *Yawn* go and save your patronising and ignorant comment for somewhere else. 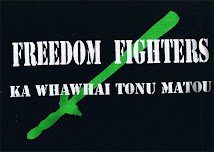 Aotearoa is unalienable MAORI LAND. Send the POAKA back to ENGLAND! 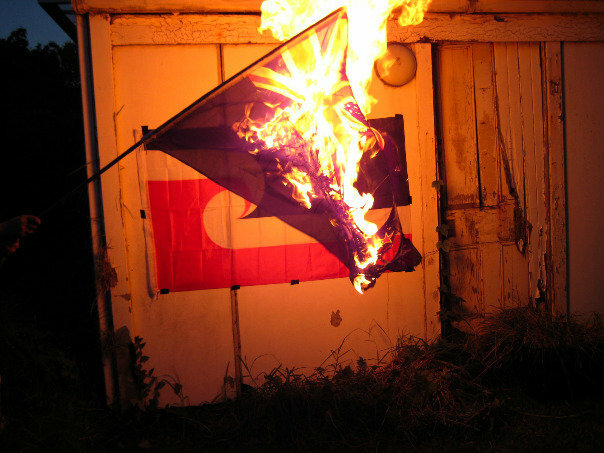 Today we burn the flag. Tomorrow we burn the houses. Even Scotland is sending the English home!